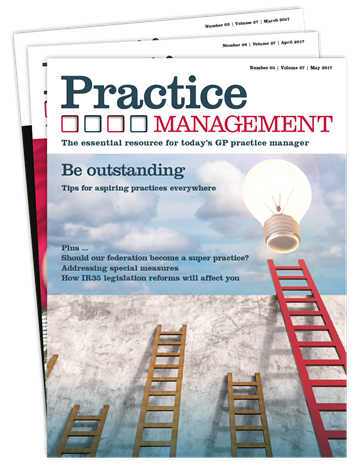 Practice Management is the professional magazine dedicated to the needs of GP practice managers. 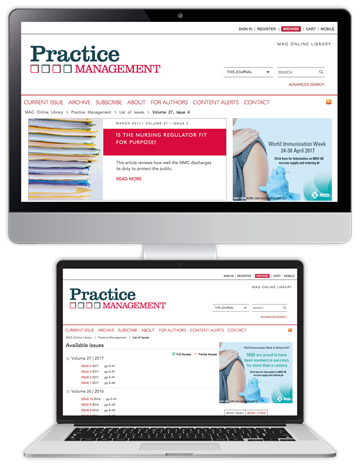 We believe that primary care practice managers play a crucial role in delivering care and improving outcomes for patients. 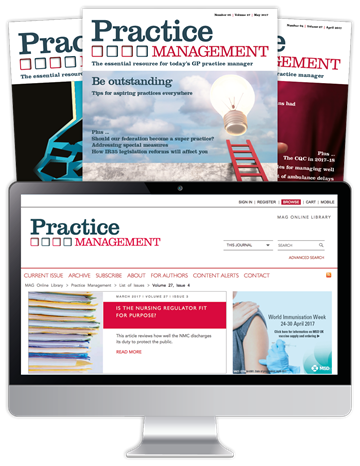 The magazine aims to support managers in the work by ensuring they have access to a wide range of expert analysis and authoritative advice. PLUS your FREE gift: Developing Management Potential (worth £19.99). This book covers management skills with examples of best practice, showing readers how to lead, support and motivate care teams effectively. Save 10% when you subscribe today, and receive the magazine and your free gift from just £4.20 per month. To claim this offer, please select your appropriate subscription option below, and quote coupon code PRM18C when prompted at the checkout. Offer ends 8th June 2018. *Gift special offer not available to existing subscribers. Your free gift will be mailed to you within 30 days of purchase. Only one gift per order - while stocks last. We do not provide cash alternatives. Annual direct debit/credit card subscriptions only.